Being a travel freak, I have been travelling all over India and abroad in search of uniqueness and a state in our own India went unnoticed. When planning a holiday this November, all our family members agreed that Rajasthan was probably the best destination to visit and from there, everything fell into its place! The journey started with an urge to relive history, feel the royalty and see the colours of Rajasthan. We planned on a 6-day tour to Rajasthan and flew from Chennai to Jaipur. From the airport we drove to our hotel in Jaipur. Take a drive along the city before you check into the hotel to let the thought of being in Jaipur sink in. You may happen to pass along some of the beautiful sites along the way which you can explore the next day. The name “Pink City", I have to admit attracted me. I was eager to know the reason behind such a name and Jaipur did not disappoint me. The city is simply irresistible and beautiful and an epitome of magnificence and vibrancy. We decide on visiting Jal Mahal before reaching our hotel. Jal Mahal is the perfect place to define beauty, located in midst of sparkling water and lush green hills, in the middle of Man Sagar Lake My disappointment of its inaccessibility is soon overridden by awe as I see the palace lit up with lights as the sun gradually went down. The Mahal has been built in the Mughal and Rajput style of architecture and sitting on the banks of the lake watching the monument could be an experience in itself. .The scenery is picturesque and we feel extremely calm spending time with silent water and the melody of chirping birds of words. A makeshift market place was in place around the pavements selling shoes, clothes and even food to be fed to the roaming pigeons. We move on to the architecturally rich Birla temple (Laksmi Narayan temple), which is an epitome of beauty, peace and spirituality. Constructed according to modern times it is a tourist attraction. It is time to hit the bed after a long day. The next day made me experience the most vibrant city I have ever seen. We plan our tour on a gradual progression so that we do not have to spin around in circles going back and forth the same place. The first thing that catches your eye as your car enters through one of the seven gates into Old Jaipur is the universal manner in which the colour Pink has been used on the buildings. . Jaipur has been popularized with the name of Pink City because of the color of the stone exclusively used for the construction of all the structures there and it is the colour associated with hospitality in Rajput culture. The tradition has been sincerely followed by the residents who are now, by law, compelled to maintain the pink color. Displaying an aura of Rajasthani splendour is Jaipur, its picturesque capital. The other unique aspect that catches our eye is the handwritten signages, a pleasant change from the digital ones. We stop at Hawa Mahal, an architectural marvel of Jaipur, situated in the middle of Jaipur's old city. Its unique five-storey exterior is also akin to the honeycomb of the beehive with its 953 small windows called jharokhas that are decorated with intricate latticework. It is just a photo stop as it is in accessible to the public. A perfect blend of Rajasthani and Mughal architecture, Hawa Mahal was built to enable women of erstwhile Royal Family to watch city festivals and processions through small intricate windows thereby maintaining their privacy. Built in red and pink sandstone, this palace rises 50 feet above the ground level and is erected on a raised podium. We head out to this sprawling complex, the City Palace, located in the north-east part of old city. Our driver is in a hurry to reach the City Palace and are told by him to be out of that place in an hour and half but our small group of six people exceed the limit by a couple of hours ( doing some shopping inside the complex). He felt terribly annoyed and went on complaining about it during the rest of the tour! Once you visit the City Palace, you can see how the people lived life "King Size". A classic mélange of Rajasthani and Mughal architecture, this complex displays an exquisite workmanship, crafts, and richness of bygone royal era. floor has a different name assigned to it such as Sukh Niwas, Ranga Mandir, Pritam Niwas and Mukut Mahal. House to current Royal Family of Jaipur, the entrance to this private section of Palace complex is through Tripolia Gate. Most part of this complex is inaccessible to general tourists, excepting the ground floor which houses a museum containing paintings, manuscripts and other precious art items of the Royal family. On the top of the Chandra Mahal we see the unfurled Royal Flag which is an indication of King’s presence in the Palace. The main attractions of Diwan-I-khas are two large silver urns that are 1.6 meters in height and 340 Kilograms in weight. The cost of it today will be running into lakhs!! Maharaja Madho Singh Ji II of Jaipur used them to carry sacred Ganges water for drinking during his visit to England in year 1901 for King’s coronation! Wow! What luxury is this? Close to this palace is Jantar Mantar, a UNESCO World Heritage Site, which is the world's largest stone observatory, close to the city palace. We buy tickets to enter here but hardly are able to go around owing to shortage of time! There is a display of a remarkable collection of architectural astronomical instruments of medieval Indian astronomy. Jantar Mantar was named as "Yantra Mantra" meaning "Instruments and Formulae" but the term got mispronounced and changed to Jantar Mantar. Besides the attractive Sundial, all the technical instruments make a worthy watch. We leave the place in 10 minutes as our driver kept calling us every 15 minutes! 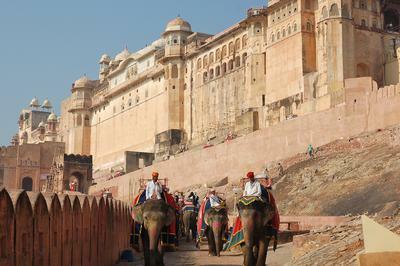 Our next stop is at Amber or Amer Fort: I could already notice the boundaries of the fort from a distance. The off-Yellowish lines visible from a distance added on to the excitement. Scenes from movies and innumerable music videos had featured this sight several times and it all came running down. It was exactly how I had imagined it to be. We get a magnificent view of the fort as you approach it by car. Majestic, Outstanding, Magnificent-These are the words you say and hear repeatedly when you visit this Fort! This fort is known for its unique blend of Rajput and Hindu Traditions and the usage of Red Limestone and Marble. This fort is a true depiction of creativity and craftsmanship. As you move around the fort, the winding stairs, the cobblestone roads and the huge gates are bound to take you back in time. The "Diya" used in the forts to light up the hallways stands carved into the walls-‘how would the fort look in the night with all the diyas lit’ thought I !The engravings on the wall; the mirror art; the figure paintings, and the description of the different sections; makes it a worthwhile place. The Fort has various courtyards and chambers but the major attractions of this fort are the Sheesh Mahal, the magic flower and the Maota Lake which it overlooks. The fort has a multistoried layout which is no less than a Bhool bhulaiya of sorts with the tiniest of windows and doors spread throughout the structure. Kesariya Balam aawo ni padharo mhare des ni Kesariya Balam aawo sa padharo mhare des- The soulful rendition of this popular Rajasthani folk song made our heads turn towards a man sitting in a corner and tuning his instrument. Stood for a short while and listened to the enchanting music. We miss the wonderful “Sound and Light’ show owing to paucity of time. Our sightseeing ends by 5 in the evening and off we are to Chokki dhani village, which is around 15 kilometres from Jaipur. It is around 7:00 PM by the time we reach there. Feel the pulse of authentic Rajasthani village culture at ‘Chokki Dhani’, an Ethnic five star village heritage resort on the outskirts of Jaipur city. As soon as we enter this heritage complex, women decked up in traditional Rajasthani attire welcome you by smearing your head with Tilak while a traditional shehnai churns out welcome notes filling entire atmosphere with a sense of energy, auspiciousness and heart-felt welcome. Live folk dances, astrologers, acrobats, snake charmers, camel and bullock card rides transport you further into rich and vibrant Rajasthani folk culture making every moment cherish able. Exhausted and tired of roaming in this sprawling complex, a traditional dining hall and open dining area renowned for serving traditional Rajasthani culinary delights fulfils your gastronomic needs. There was not much that could be done other than going back to the guest house and crash. Dozed off swiftly and rightly so as the next day was going to be a hectic one as we were to leave Jaipur and proceed to Jodhpur. All in all, Jaipur is a perfect amalgamation of old and new world charm.